The 2018 Annual Session of the Parliamentary Conference on the WTO, Geneva 6 and 7 December 2018. Members discussed the future of the World Trade Organisation (WTO) at the seat of the WTO in Geneva. A delegation of five Members, mostly of the Committee on International Trade, joined other parliamentarians in dialogue with WTO negotiators and officials on future tasks and opportunities facing the body. At the Parliamentary Conference on the WTO, an annual gathering of deputies co-organised by the European Parliament, the topics discussed included emerging trade wars, the return to unilateral measures, and the looming paralysis of the Appellate Body, the dispute settlement instrument of WTO. Meeting of the Steering Committee of the Parliamentary Conference on the WTO, Brussels, 24 and 25 April 2018. 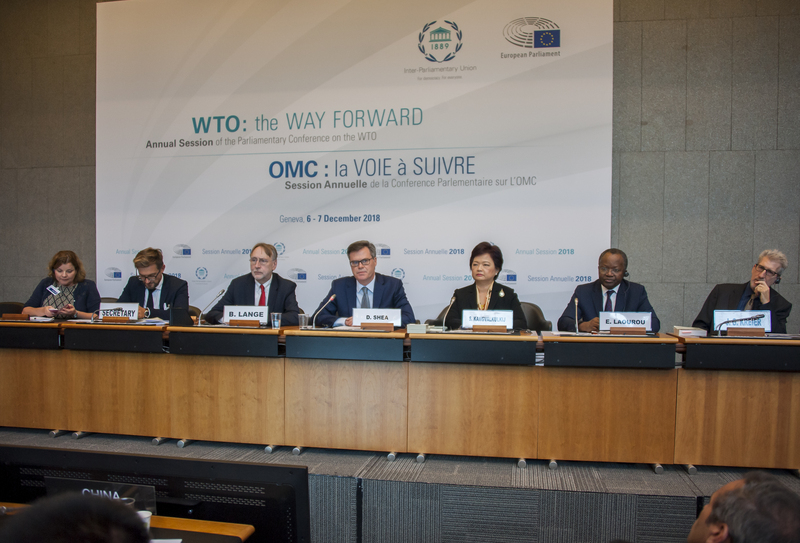 The Parliamentary Conference on the World Trade Organisation (PCWTO) is a joint project of the European Parliament and the Inter-Parliamentary Union. Its objective is to enhance the transparency of the WTO and to make the WTO, an inter-governmental organisation, accountable to elected representatives of the people. Sessions of the Parliamentary Conference on the WTO are held annually. When the WTO holds Ministerial Conferences - usually every two years - the PCWTO meetings are held in shortly before the Ministerial Conferences, in the same location. The most recent meeting of the Parliamentary Conference on the WTO was held in Buenos Aires in December 2017.